In today’s age, cotton is one of the most versatile crops that the earth has to offer. Many of us are familiar with the usage of clothing in cotton, but cotton is also used in beauty products and food products as well. Look at the clothes that you are wearing right now, a majority; if not all of it is made out of cotton material. Cotton is favorable in clothing because of its softness, durability, and insulation characteristics. The leftover cotton seed can be used to make cottonseed oil and cotton meal. The oil can be used in cooking, such as deep frying foods or used in salads as a dressing. If not used in cooking, cottonseed oil can also be used to make tons of oil-based products such as soap, candles, or even cosmetics. Cotton meal is rich in protein and is used for human consumption or for animal fodder. These cotton products and byproducts are used by people all around the world, the amount of cotton consumed must be insane! The growth of cotton takes up approximately 2.5 percent of the world's cultivatable land across 85 different countries. During the year of 2015 to 2016, the world consumed a staggering amount of 24.2 million metric tons of cotton. This includes uses of cotton in all its forms. However, with the good comes the bad and although cotton has a ton of benefits, it also carries many social and environmental drawbacks. In today’s age, cotton is one of the most versatile crops that the earth has to offer. It has a wide range of use from cooking to clothing. Clothing is one of the most common uses of cotton, and this can be traced back over 5000 years ago. Cotton was discovered in various locations such as Mexico, India, and Egypt. From there, traders from India brought their knowledge of cotton to other countries such as Europe and Asia. Slowly, cotton began to grow in popularity as countries saw how durable and versatile it was. As more and more countries began to utilize cotton, the methods of transforming cotton into usable material became increasingly advanced which allowed the global production of cotton to grow exponentially. However, these offshore cotton products threatened the local British manufacturers, so the government implemented the Calico act in 1721 to counteract the invasion of cotton products. 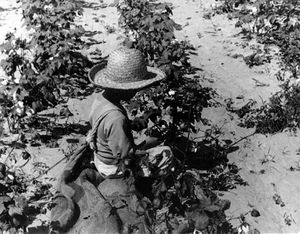 This act outright banned the sale of any cotton product. Thankfully, the act was repealed in 1774 as technological advances made it economically viable for Britain to start producing their own cotton products. During the 17th century, Britain was one of the powerhouses in the cotton industry. Finding success with the poorer class of people, cotton quickly became one of the most traded goods for Britain because it was cheaper than other materials available such as silk. Cotton made up a majority of Britain’s exports during the late 1700’s and early 1800’s. By the 18th century, the industrial revolution would make it even easier to produce mass quantities of cotton. Cotton mills began to open up in Europe and North America with resources such as child labor and slavery, mill owners were able to rack in huge profit by making the workers work long hours and paying them with low wages. As the global demand for cotton grew higher in the tail ends of the 18th century, Capitalists began to look to expand and place mills on other locations. One of the prime locations was the United States, with plenty of free land and resources. These new mills particularly flourished in states that allowed slavery, such as Georgia, Alabama, and Mississippi. Fast forward to the 21st century, and cotton has taken over the industry. As a kind of important cash crops to most countries, cotton farming has had a history of more than five thousand years. Due to its complicated process of producing and spinning, cotton was not the prime fibers in the first place and people had no machine but have to do all the work by their hands. In the 17th century, the industrial revolution and the invention of the cotton gin in the U.S. played very crucial roles of cotton production, and therefore, because of technical innovation, cotton has occupied approximate 48 percent of textile production in the world. To plant good variety of cotton, the following conditions should be considered. Cotton is susceptible to many insects, including cotton bollworms, cotton borers, red spiders (cotton spider mites), and cotton aphids. Therefore, not only spraying cotton insecticide, but also strict quarantine to prevent the spread of cotton bollworm are necessary. For instance, cotton aphids can be controlled by spraying Malathion 0.08%. Cotton fungal and bacterial diseases include root rot, fusarium wilt, and bacterial blight. These diseases can be prevented by crop rotation, the use of fertilizers, and dealing soil and seeds with chemicals. Layering Perspectives: Additional Cost and/or Implications? What other costs and/or implications become apparent when cotton farming is viewed through the lens of other disciplines and professions? What special expertise, resources, or theoretical orientations might others bring to help us better understand the costs and/or implications associated with cotton farming? The social and ecological aspect of cotton farming are linked to one another. Social problems of farmers arise due to the economic instability of the cotton farming industry while having large ecological pressures. A prominent example of a social problem takes place in India where nearly 90% of rural Indian farming households are in debt as of early 2017. In years 2013 and 2014, there was a surge in global cotton demand producing record harvest numbers as high as 40 million bales which eventually pushed down cotton prices and raised production costs. The increase in pesticide, fertilizer, and seed prices along with the decrease in the price of cotton eventually create a negative net income creating debt to farmers across the country. Unseasonal weather events such as rain and hail due to climate change destroy a large volume of crops and roads for transport each year, increasing transport costs and further decreasing the annual potential yield. Commercial cotton companies also fail to meet payment dates, inconveniencing farmers to continuously use income from cotton companies to repay offset loans which were caused by the same cotton companies to begin with. Indian cotton farmers eventually lose their farm property and commit acts of suicide. A survey conducted in 2010 recorded that of 7,000 farmer suicides, more than 4,500 (equates to approximately 65%) are victims of suicide due to debt related purposes. 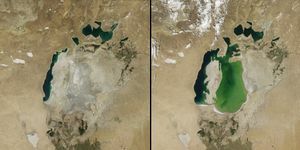 A prominent socio-ecological example of the severity of cotton farming is the diminishing of the Aral Sea. In the 1960’s, Soviet engineers built irrigation networks which consisted of several thousand miles of canals, dams, and reservoirs to redirect streams that fed the Aral Sea to irrigate cotton and wheat in Kazakhstan and Uzbekistan. Over several decades, the lake began to recede in depth eventually revealing the bottom of the lake. What a shrinking lake means is that salinity levels start to increase as salt levels increase due to evaporation, pesticides, and crop-killing salts accompany a smaller volume of water. Several species of fish which died in millions have also gone extinct because of high salinity levels and low water volume. These problems cause difficulty for local communities who once reside close to the lake as the local fishing industry is destroyed by the diminishing fish populations and dust storms forming much more often by low moisture levels. This proves that the Aral Sea, being more than just a climate issue is also an extinction issue. On the other hand, modern players of the cotton industry, such as the fashion industry demanding high volumes of an irrigation intensive crop lead to irreversible levels of species and environmental destruction. Much of the cotton farmed in Uzbekistan is hand-picked using forced labour. The Uzbekistan Government officials also order employees which ranges from doctors to students, and even children as young as nine years old which is considered morally wrong and illegal since 2012 but disregarded. Having both the destruction of the environment and forced labour being linked is a severe issue that needs reevaluation by the cotton industry. 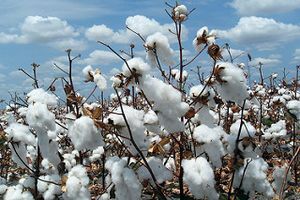 As cotton is becoming a less popular crop to cultivate, there have been many attempts to revive cotton farming by means such as government support, mechanization, genetic modification, and farming alternative cotton species. Countries such as Kenya have begun working together with their cotton farmers to better growing conditions and increase annual yield to meet global demands through mechanization and more efficient irrigation projects which utilizes more on rainfall. Mechanization allows larger amounts of cotton can be harvested which improves partnerships between local and international businesses as well as improving quality of life for farmers. Kenya considers crop an important method of employment creation. By increasing annual yield, large amounts of jobs can be created in a chain ranging from cotton production, to spinning and weaving, to the finished product. These improvements are set to be held by shifting farming and production policies to further benefit locals with more work and increase transparency in pricing to prevent exploitation of farm workers. Taking different varieties of cotton from other countries, three new genetically modified varieties of cotton seeds are being tested, and having two approved as of March 2017 by the ministry of Kenya. This helps farmers maintain a stable crop yield, increase cotton quality, and resist termites and weeds without the use of herbicides and pesticides. The Kenyan government is also enhancing relationships with researchers to maintain and increase cotton quality control. Viewed through the lens of other disciplines and professions, what other actors become relevant when considering solutions to address challenges associated with cotton farming? What special expertise, resources, or theoretical orientations might others bring to help us better resolve challenges associated with cotton farming? Although cotton is so commonly used today, the price which we pay will have disastrous effects on the global ecosystem over the long term. In order to grow cotton, many conditions have to be met and lots of resources must be used. In order to produce one kilogram of cotton, over 20,000 liters of water must be used to water the plants. Additionally, because cotton is vulnerable to many plants and diseases, the plants must be sprayed with chemicals and insecticides to make sure the plant comes to fruition. These sprays pollute the ecosystem and the wildlife around it which lowers the quality of wildlife around the area. Combined with the large amounts of water used to keep the plants alive and maintained, the contaminated water leaks into the ecosystem and harms it greatly. Since cotton takes approximately 200 days to mature, contaminated water is continuous being poured into these ecosystems. 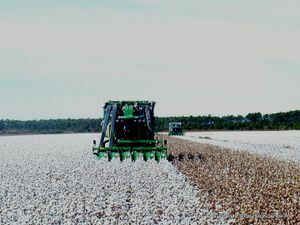 Once these plants are ready to be harvested, special machines must be used to harvest the cotton efficiently. This further contributes to the negative ecological disturbances from this growing process. Along with the abiotic effects, there are also biotic effects. Cotton is the main income source for over 250 million people, and when the price of cotton fluctuates, the farmers feel every up and down. Farmers in third world countries especially feel this burden as the income they make barely covers their living expenses. These farmers must also factor in the immense startup and maintenance costs to produce the cotton, which is not guaranteed to sell at the right price. Many times without sufficient equipment, farmers resort to using themselves to make sure the cotton plants are growing. In the midst of insecticides and other chemicals, farmers health quickly come into question. However, countries are beginning to recognize the consequences of growing cotton and they are actively trying to find a solution. In Kenya, the government has begun to work with its cotton farmers to make sure they are able to farm safely and effectively. Providing farmers with better equipment and developing genetically different cotton to be more resistant to the environment are some ways that the government is helping the farmers. Through this relationship, Kenya hopes that the cotton yield will be higher and will be able to create more jobs for the locals. ↑ Howell, Stacey (July 21, 2015) How Much of the World's Clothing Is Made From Cotton? ↑ Parry, Martine (June 11, 2015) The Role of Cotton in Economic and Social Developement.